Buttons which are dimmed if a unit as that buff or a related buff applied. Buttons which appear when a debuff is applied to a unit. 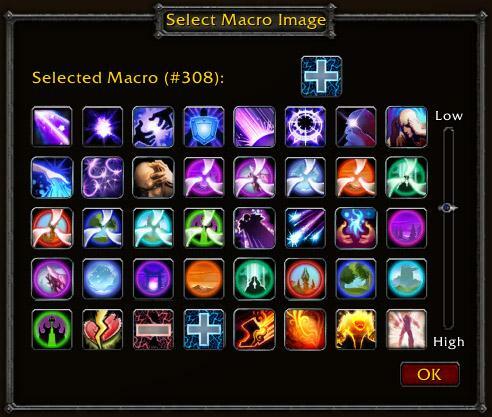 for soloing, buttons for instances, buttons for raids, buttons for specific bosses (such as Baron Geddon in MC (to all priests to debuff), buttons for PvP, etc. 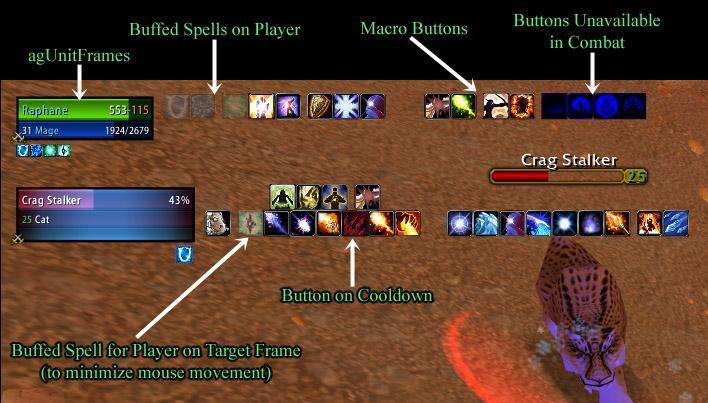 Assign buttons to unit frames that when clicked cast spells on different units. 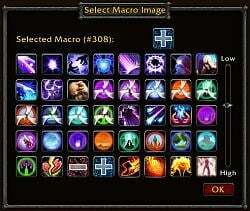 This feature allows, for example, buffs and heals for the player unit to appear within the target buttons to minimize the amount of mouse movement between buttons. Works for any kind of non-casting classes; specifically warriors and rogues. I know that the documentation is a complete mess at the moment, I am already working on it. But I wanted to have a released version for cataclysm start. Before upgrading, please read the included 'readme.txt'. You will loose your config, so read carefully ! This is an abbreviation for StandardButton. I recommend to use 'CB_' as prefix for custom buttons. This custom buutton will only chnge to the state BUFFED if the destination unit is buffed with your OWN Renew. New: new debuff condition "Death"
A button with this condition is only shown if the destination unit is dead. New: new debuff condition "Purge"
A button with this condition is only shown if the destination unit has at least one buff to purge. Here unit# will be rpalced at runtime with the unit the button is attached to. !!! Improved: Internals are mostly rewritten from scratch for better performance  !!! Please refer to 'z_historic_Changelog.txt' for older changes. 'isUsableSpell' is broken, there is nothing I can do to change that. That means: Some spells are reported 'not usable' if you target a hostile target or NPC (like 'PowerWord: Shield' for example). !!! Improved: Internals are mostly rewritten from scratch for better performance !!! Last edited by abinning : 08-29-12 at 01:06 PM. I am making progress. I think it will be usable tonight. I wish you the best and hope you can make XUB work again. I was deeply saddened to find it did not load at all after 5.0.4, even if you check to load outdated add-ons. Am I curious if I am the only one? I'll try to flush my cache and WTF folder to see if that helps at all, but I doubt it. Last edited by jrob007 : 08-28-12 at 06:28 PM. Tomorrow we shall see how badly it is broken. Anyone plan on trying to fix this? Last edited by abinning : 08-28-12 at 11:37 AM. 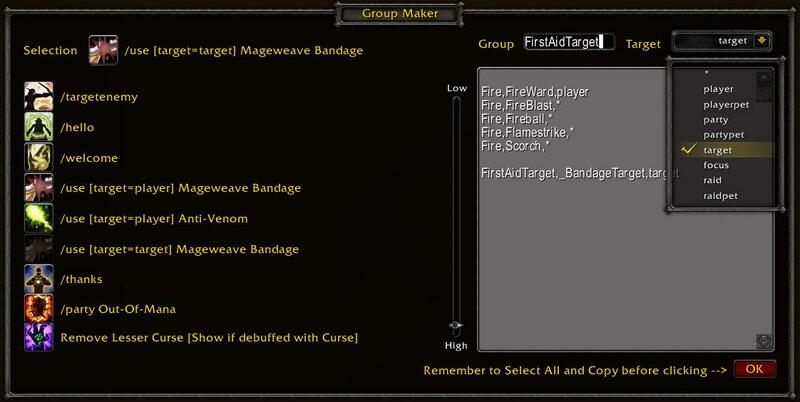 I just wanted to post that the latest version posted here still works in WoW as of July 27, 2012. Just hope it will be compatible with MOP! You and me both my friend. I am not sure it is being maintained at all anymore, and if it is not I hope a dev picks it up. I actually get emails still when someone posts here, but I'm no longer contributing/supporting this add-on. I moved from WoW to SWToR to The Secet World, since my involvement here. Hopefully the original developers are still playing WoW and monitoring this site. 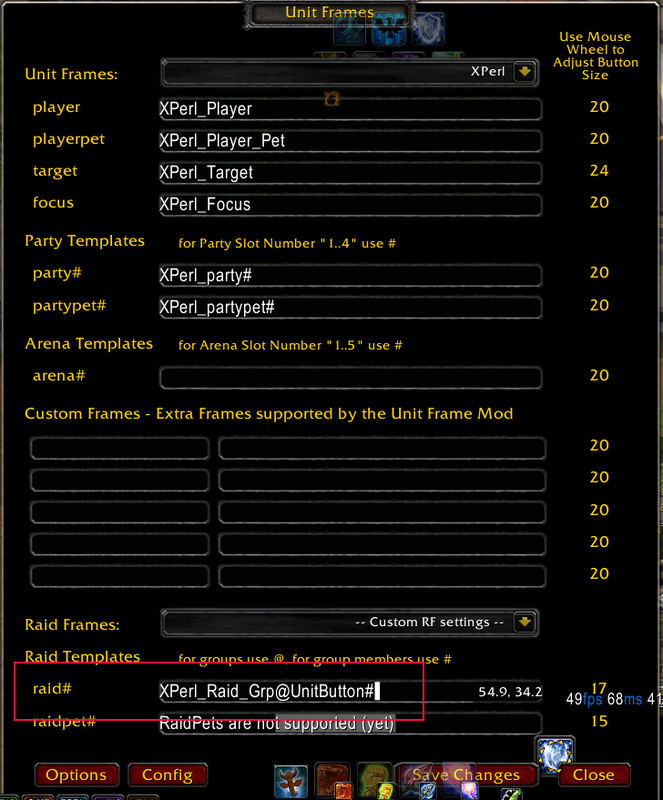 Since the latest patch, i am unable to edit my unit frames or it crashes. Does anyone have a fix for this?? I am using X-perl. Did you already do this? This is an older config, but you can see what I used to do with mine. Now I have 4 buttons on each row, and some different macros. Last edited by Deca : 08-14-11 at 05:36 PM. I normally use xperl, but so far I can't get that working. It's nice to know that it will work, I just have to figure out how. I do have the player and party frames working, but so far nothing for raid. I use xperl, many others use vuhdo or shadowed. Anyone have raid frames, any raid frames working?